Welcome to Go Quilt and Stitch, a website for kids or young people who quilt, or those people who help them. If you love fabric and want some ideas, you have come to the right place. I love working with fabric and thread but sometimes I need a bit of inspiration to get started. I hope this website will help you find something you would like to make yourself or with others. There are ideas where all you need is a needle. There are also ideas where you'll need a sewing machine. I made a QR Code for this website. QR stands for Quick Response and they are codes, usually in a black and white matrix which you might have seen on some packaging or on adverts. The codes can be scanned by camera phones or tablets. 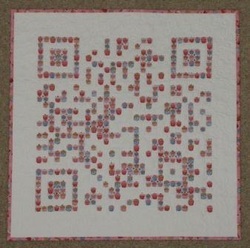 If you scan my cupcake QR Code Quilt you will be taken to the Quilting and Stitching website. The quilt is made by cutting out 414 cupcakes and bondawebbing them onto the background fabric in the correct positions. I then machine quilted around the grid pattern and bound the quilt with some more cupcake fabric. For a project with a cupcake theme, checkout my Cupcake Hanger pattern. I keep adding to the Go Quilt and Stitch website, if you don't find anything you like at the moment, please check back in soon or contact me with any ideas you have.